As fuel prices continue to rise and potential new-boat buyers watch every penny, it&apos;s no surprise that savvy boatbuilders have come up with designs that offer fuel efficiency and comfort in packages that likely will succeed in today&apos;s marketplace. The builders of the Monomoy First Light and Cutwater powerboats have done just that. These are nifty boats that are very different in layout but share a number of elements that are worthy of attention. And the boats are just different enough to be a little quirky, which if nothing else (and there is something else) makes for a great conversation starter at the dock. The Monomoy First Light and Cutwater boats are made of durable materials and feature intelligent engineering. They are built to last and are modest in displacement, translating to efficiency on the water and on a trailer towed behind a pickup truck or SUV. They have single engines offering simple, reliable and efficient propulsion, along with a minimum of complexity for their missions. As I indicated, both are trailerable, and a family will be able to venture hundreds of miles from home to enjoy these boats in distant waters. As a boat owner who trailers to Maine and Cape Cod, Mass., every summer, I can tell you trailerability adds considerable value. Let&apos;s take a look at the boats to see what makes them special and how they differ in function and form - building materials and processes. Brad and Mike Pease own and operate Pease Boat Works and Marine Railway in Chatham, Mass., repairing and restoring wooden and wood-epoxy boats in their waterfront shop on Cape Cod (www.peaseboatworks.com). When I visited the yard this winter, several classic wooden sailboats were on the railway, restored and ready for spring launching. Inside the shop was a nearly completed Monomoy First Light 26, an outboard-powered wood-epoxy side console and the fourth hull of the series. 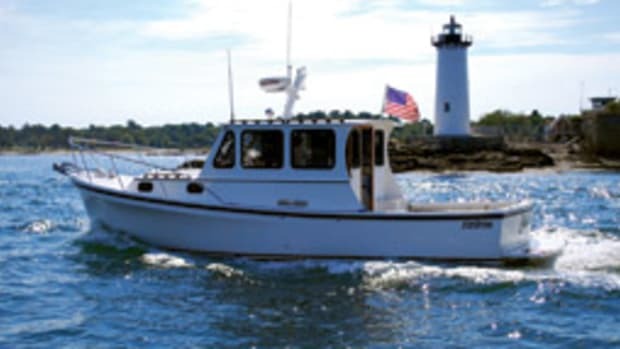 Designed by Matt Smith, a Rhode Island resident who honed his skills at Derecktor Shipyard, Boston Whaler, Hinckley and Little Harbor, the First Light is an open inshore boat with a self-bailing cockpit. Two versions are available - one with the outboard set inside a well in the cockpit and covered by a hinged engine box, and the other a more conventional design with the outboard on a transom-mounted bracket. Typical power for the First Light 26 is a 115- or 140-hp Suzuki for top ends of 26 and 29 knots, respectively. For anyone willing to settle for a 22-knot cruise - which given the fuel efficiency numbers would most days include me - the 140-hp Suzuki at 5,000 rpm delivers a crowd-pleasing 3.2 nautical miles per gallon (3.7 statute mpg) at that speed. The range at 90 percent fuel capacity (with a 41-gallon tank) is 118 nautical miles. For comparison, this kind of efficiency is typical for a well-designed 20- to 22-foot deep-vee center console with a 225- or 250-hp outboard. You won&apos;t have the deep-vee&apos;s rough-water ride (neither do many of today&apos;s leading "offshore" center consoles, for that matter), but you won&apos;t cringe every time you pull up to the gas dock in a First Light 26, either. 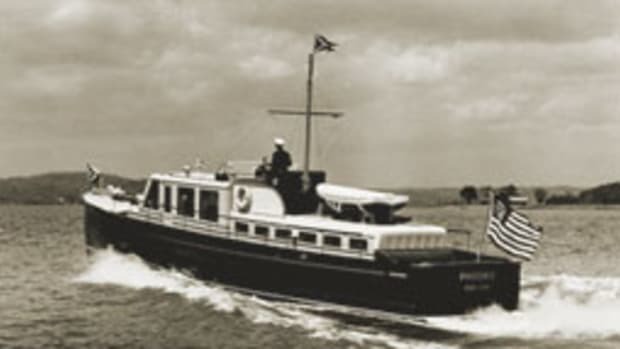 The overall length of the two versions is about the same, with the transom-mounted boat&apos;s bracket actually amounting to moving the full transom forward several feet while keeping the original running surface. 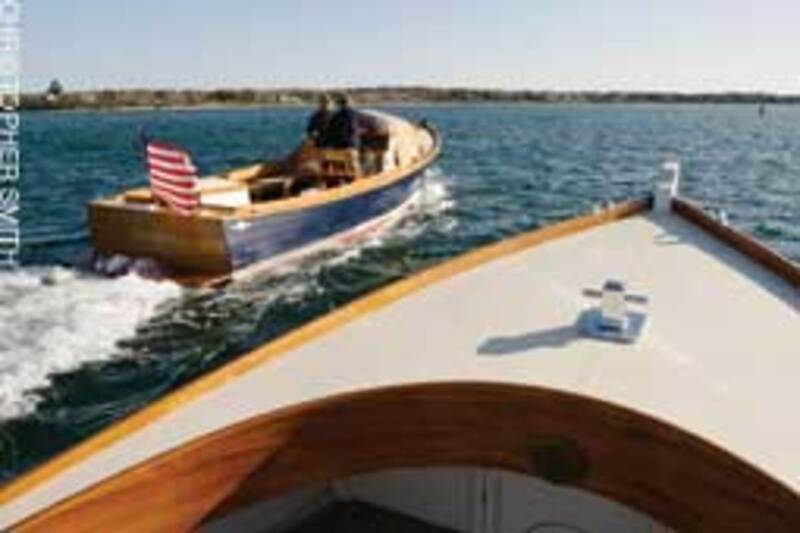 The hulls on the four boats built so far are the same, although the owners had some latitude regarding the console size and positioning and the fixed seating arrangement. The hull is quite light - 3,200 pounds in the bracket version and 3,700 pounds with the well, including the engine. In photos the builder provided, the modest displacement shows in the way the boat skims along the surface with about a 4-inch wake astern. The hull has a shallow, fine entry and modest deadrise, making it suitable for running comfortably in the 16- to 20-knot range in a 2- to 3-foot chop. The hull will not keep up with a deep-vee design in rougher water, but it won&apos;t burn anything close to the amount of fuel a heavier and more aggressively vee-bottom boat would consume. In short, the First Light should make a fine boat for use in nearby Pleasant Bay or in a light chop off Martha&apos;s Vineyard, which hull No. 4 will call home. The First Light typically has a large console either on centerline or to starboard, along with built-in side seats forward. A canvas dodger forward provides protection from the elements and provides cover when the crew decides to overnight. The boat I saw in the shed was having convertible seats installed with side flaps that hinge up and convert to berths, along with an extended spray dodger and a Porta Potti beneath the seat aft, adding an element of versatility for the owners. The boat has a traditional look, with a straight, slightly raked fir stem and a low sheer, which gives the hull its pleasing proportions. Aesthetically, I&apos;m a sucker for lapstrake hulls, so this boat quickly won me over. I once owned a 1960 20-foot Penn Yan made of plywood planks and white oak steam-bent ribs. It was another pretty boat, if not as good a choppy-water craft. The First Light&apos;s lapstrake construction is also more than just a pretty face; it has structural merit in that the half-inch planking becomes a full inch thick at every overlap, and this serves to stiffen the hull sides and add longitudinal strength at very little weight penalty. Another detail I like is that the strakes seem to be let into the stem several inches abaft the leading edge, giving the hull a look of dragger-like strength. This effect is actually created by the builder adding an external stem. Although the boats are stick-built by hand, they are semiproduction in the sense that the Peases have developed patterns to mark and cut out essentially every piece of wood used in the hull. This includes the keel-capped with a shoe of worm-proof and abrasion-resistant angelique wood - the knee and stem, the frames (ribs), the plywood bottom sections and each hull plank. The hull planks are cut two at a time for use on the port and starboard sides - mirror-image-like as you&apos;d see with matched-grain paneling. The molds, which give the hull its shape in section, are set up on a heavy strongback that keeps the mold framework level, straight and plumb. The hull&apos;s fir frames are attached to the molds. Next come the stringers, transom, bulkheads and chine logs. The bulkheads are made from 3/4-inch Lloyds-approved okoume plywood, which has more layers of laminate for its thickness than construction-grade plywood for greater strength - and it&apos;s void-free. In the bottom, you&apos;ll find two layers of 3/8-inch okoume plywood that are saturated and bonded with epoxy and fastened to the stringers and bulkheads with stainless-steel screws. The fiberglass cloth sheathing adds abrasion resistance and helps seal the plywood from water intrusion. After that, the first strake goes in above the chine, and then the bottom and the first strake are sheathed with two layers of 6-ounce fiberglass cloth in epoxy resin. Each of the strakes are made of several pieces of okoume, cut from a 5-by-10 sheet of plywood, scarfed together. The rest of the hull sides are then planked up. Epoxy applied to the wood during construction is used as a glue and a sealing agent. Each plank is fastened with stainless steel screws to each rib and also to each other between the ribs, with the cured epoxy bonding planks to frames and plank edges to plank edges. The hull would hold together with either the fasteners or the epoxy alone, so think of it as being twice as strong as it needs to be. Next come the outer stem - the part that you see forward of the planking - the keel and the spray rail. 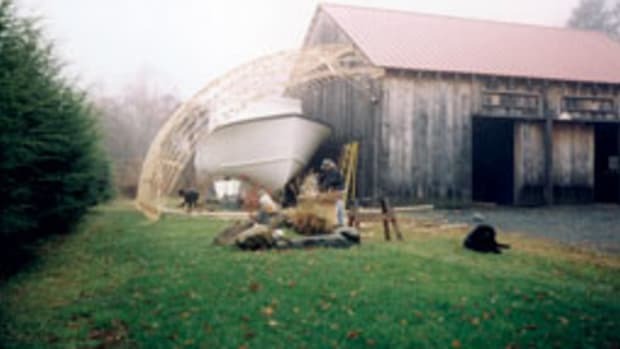 At this point in the construction process, the boat is lifted off its strongback and mold framework, flipped right-side up, and the bilges are painted with a thin, specially formulated Smith saturation epoxy designed to deeply penetrate the wood. Then the foredeck and side decks are installed - and covered in epoxy-saturated Dynel to provide a non-skid texture - along with the boat&apos;s systems, foam flotation blocks, fuel tanks and the cockpit sole. I was pleasantly surprised to see that the boat has full foam flotation, and that the foam is cut to fit the boat&apos;s bilge compartments from large blocks that are coated with epoxy to protect against water penetration and put in place atop the hull frames. This process allows water making its way below the deck to drain right from the deck opening at the hull sides to the bilge, ensuring that water cannot get trapped between the hull and the deck. The 41-gallon fuel tank (which should tell you something about how little fuel this boat burns) is made of polyethylene, so it should last indefinitely. Attention to detail is impressive. For instance, the cockpit coaming is made of a single piece of wood aft that is scarfed to mate up with four pieces laminated together forward so it will follow the hull&apos;s curvature in the bow. To finish the hull and topsides, the builders use two-part System Three low-maintenance water-based linear polyurethane paint, which is comfortable to work with and largely benign environmentally. All told, each boat takes 10 to 12 weeks to build, depending on the options the owner orders and what else is happening in the shop. The base price for the First Light 26 is $97,500 with the 115-hp Suzuki. Options on hull No. 4, set to launch a few weeks after my visit, include a varnished mahogany transom, swim platform, extended seating convertible to a berth, a 150-hp Yamaha (and a bigger engine box to accommodate it), a Porta Potti, 12-volt refrigerator with second battery, and (gasp) a stereo, which brought the price to $123,020. 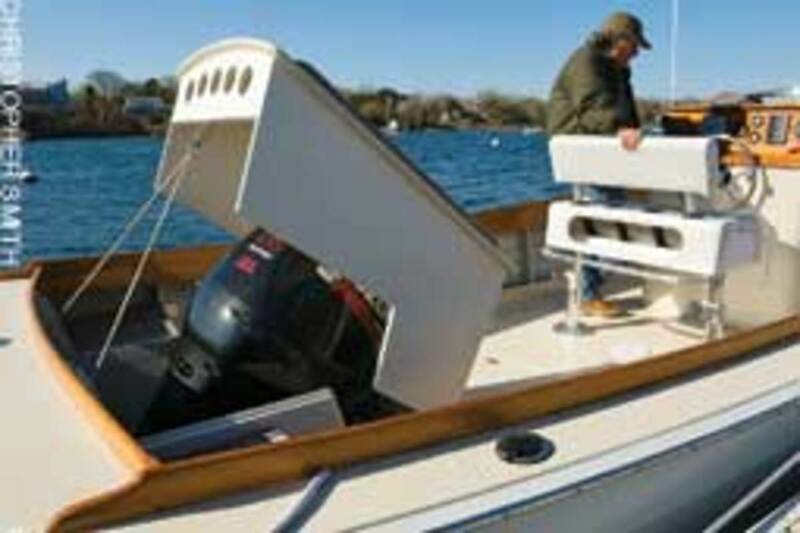 I&apos;ve never owned an outboard boat with the engine in a well inside the cockpit, but balancing the engine taking up space inside the boat is the fact that swimmers get some protection from the prop with the outboard set well forward of the transom; add a swim platform and it&apos;s farther still. The Pease brothers and their talented crew also build a Matt Smith-designed First Light 36, a sweet-looking, well-proportioned (35 feet, 9 inches by 10 feet, 6 inches) outboard-powered boat available with a pilothouse or express configuration. They offer a 5-year concierge maintenance program for $16,850 a year that includes annual pickup and delivery within 100 miles of Chatham. footer with 2 more feet of cockpit. Based in Monroe, Wash., Cutwater Boats (www.cutwaterboats.com) is a division of Fluid Motion LLC, the designer and builder of Ranger Tugs. Dave Livingston, who owns Fluid Motion, has been active - in the most positive and productive sense of the word - in the marine industry for a long time. He was president of Bayliner, and he has designed boats and solved problems for Reinell, Wellcraft and Regal, for which he designed a series of stepped-bottom hulls. His son, John, owns Ranger Tugs. You&apos;ll be reading more about both Livingstons in a future column. The all-fiberglass Cutwater has a very busy bottom, to put it mildly, with a step, keel and prop pocket. The step is designed to aerate the bottom to reduce frictional drag, while the designer took pains to channel air away from the prop. The keel adds directional stability (as long as the boat is going faster than the waves) and grounding protection, and the pocket reduces draft and shaft angle for improved efficiency. A single 180-hp Yanmar 4BY2 diesel sits down in a shallow nacelle, which lowers the height of the deck and deckhouse above, lowers the center of gravity, reduces sail area and shaft angle, and produces an altogether more seaworthy boat. I&apos;m reserving judgment on how it all comes together until I test-drive the boat at some point this season. Although all these features in the bottom of one boat could be merely a marketing gimmick, in this case there is a reasonable chance of a positive result overall. 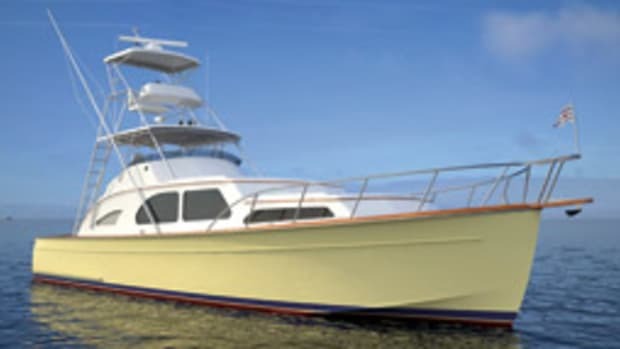 The builder says the boat has a Down East look, which is a bit of a stretch, but you can&apos;t blame Cutwater&apos;s marketing department for trying to be as creative as the engineers. It is a really nice-looking boat with contemporary lines, and that&apos;s quite an accomplishment, considering that this trailerable 26-footer with a beam of 8 feet, 6 inches can sleep six in three double berths. Boarding from the stern, there&apos;s a swim platform and a transom door, making it easy to step aboard from a floating dock. 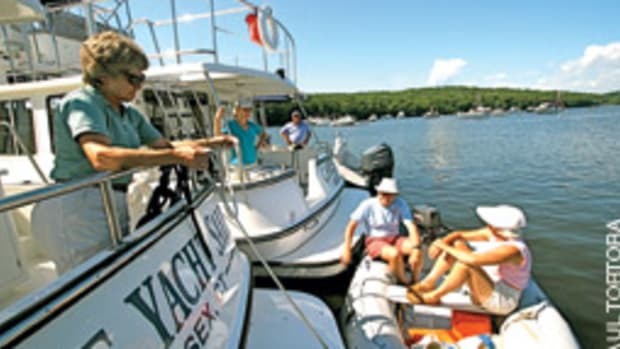 This makes the boat easier to use for baby boomers, as many of us aren&apos;t getting any younger. Small fenders are attached and integral to the aft edge of the swim platform. A transom seat that flips allows you to face forward or aft. The self-bailing cockpit has a cooler, storage for a barbecue, cabinetry and, on the Cutwater 28, a sink with a nozzle that lifts out to create a freshwater shower and an optional helm station for backing down on a tuna. A large hatch has a power lift for direct access to the engine room. A sliding door leads to the pilothouse, looking spiffy with a teak-and-holly sole. 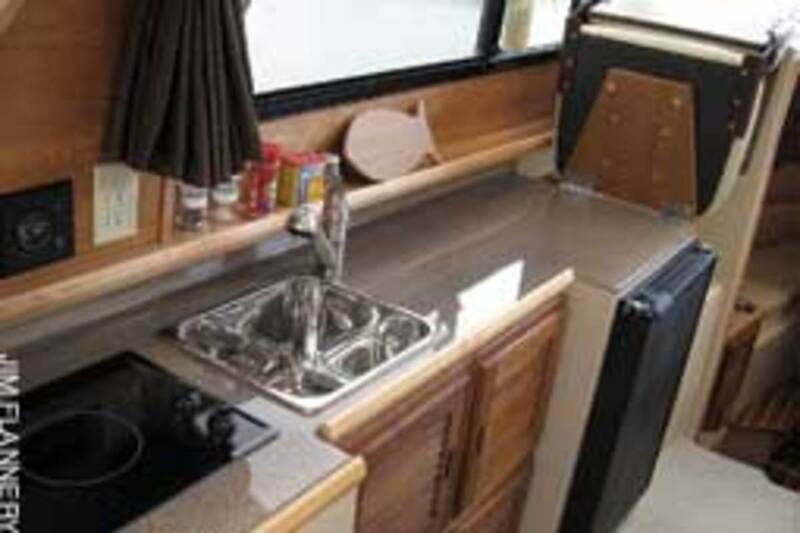 A big galley countertop, which lines the port side, is home to a sink, and you can get an alcohol/electric or a diesel (yes, diesel) stove. Opposite is a raised dinette - you&apos;ll be perched up nice and high so you can see out the windows - that converts to a double berth. 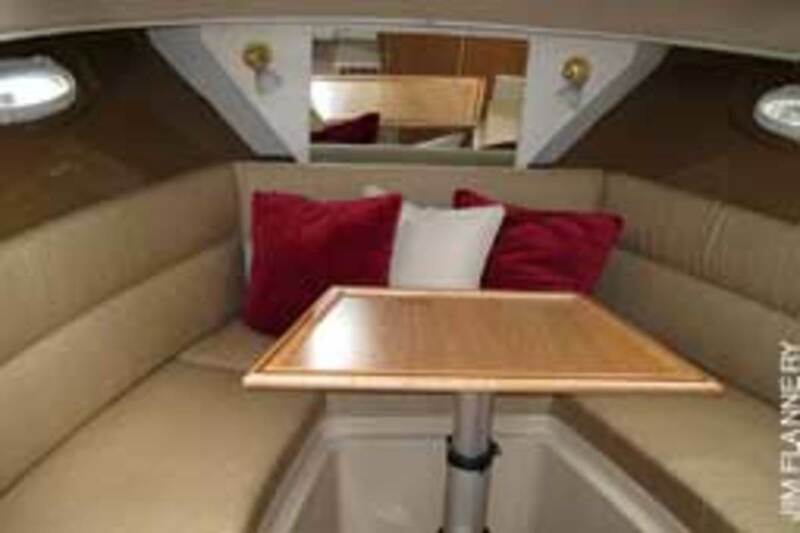 The surprise is directly below, where you&apos;ll find a second double berth that is easy to get into with the aft section of the dinette hinging up out of the way. Forward of the dinette is the helm station, and on the Cutwater 28 there is a wine cooler below the reversible dinette/helm seat, which tells you something about the target demographic. You won&apos;t have to rough it when you&apos;re out for a weekend on the water. Large side windows all around and four hatches overhead let in plenty of sunlight and fresh air. Forward of the pilothouse and down a couple of steps, the cabin has a four-person settee that converts to a double berth, with a flat-panel television aft. An enclosed head is to starboard, with 6 feet of headroom and a marine head (electric-flush on the 28-footer). 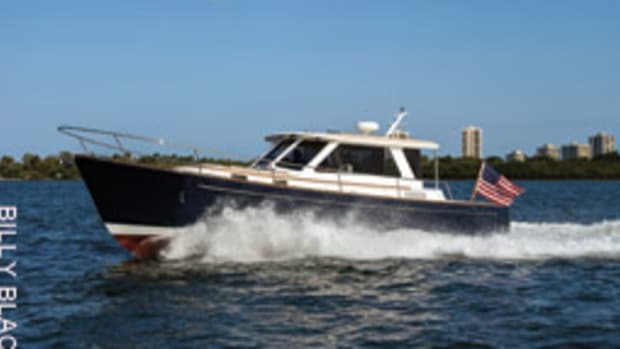 To port is a bench seat on the Cutwater 26, and a locker/mini galley on the Cutwater 28. Back topside, from the cockpit you make your way forward along narrow but flat and unobstructed side decks. This narrow side deck design opens up extra room inside, which is a good choice in my book. The boat comes with bow and stern thrusters standard, which will be comforting for anyone who otherwise would be intimidated about handling a single-inboard boat. I have concerns about the transom-mounted rudder ventilating and stalling at speed, as it has no flat ventilation plate above it to prevent air from being drawn in when the boat is on plane. 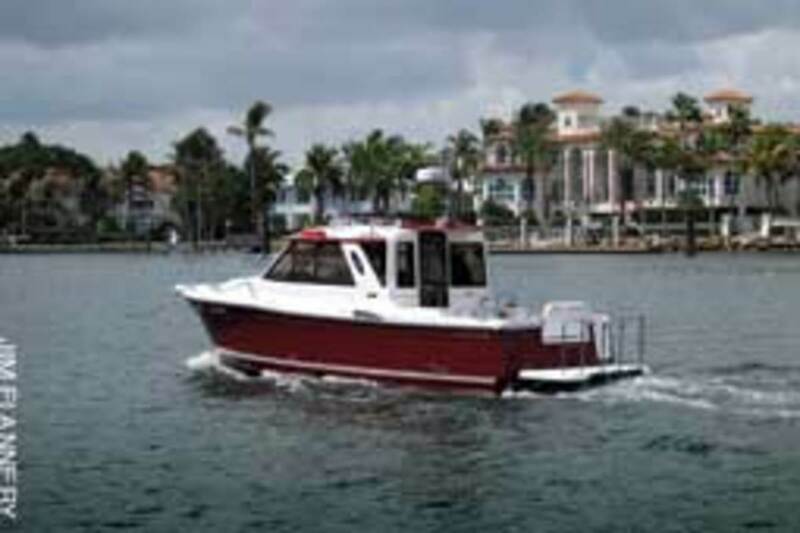 The base prices are $139,937 for the Cutwater 26 and $169,937 for the 28. Having seen the standard equipment list, you could drive away without adding options and have a comfortable time on the water. Add reverse-cycle air conditioning, a diesel stove/heater, cockpit enclosure and electronics, and you&apos;ll feel as if you&apos;re on a mini yacht. The dry weights of the Cutwater 26 and 28 are 5,900 and 6,400 pounds, respectively, so you could tow one of these with a medium-duty pickup truck or a large SUV. And having a towable boat adds real cruising options, as I mentioned above in the First Light discussion. fueled, bottoms painted and loaded with passengers and gear. One can never tell for sure about performance and comfort without having taken a test ride and spending a couple of days aboard, but these new Cutwater offerings show great promise, and I look forward to getting out on one of them. 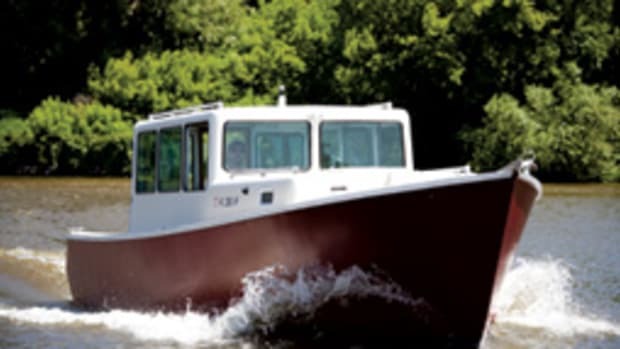 These intelligently designed boats have an ingenious interior layout that&apos;s flooded with light and has room for everything, including the kitchen sink up on the hard top, along with nice high bow rails forward, easy dock access and good looks to boot. 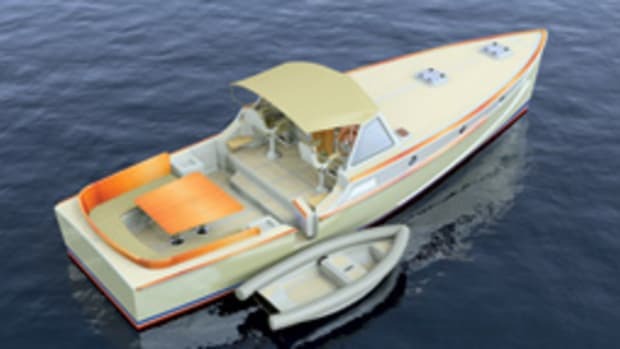 The price seems reasonable for these pocket cruisers; these are small yachts for our times, allowing people to get out on the water in comfort and style without breaking the piggy bank. What&apos;s not to like? 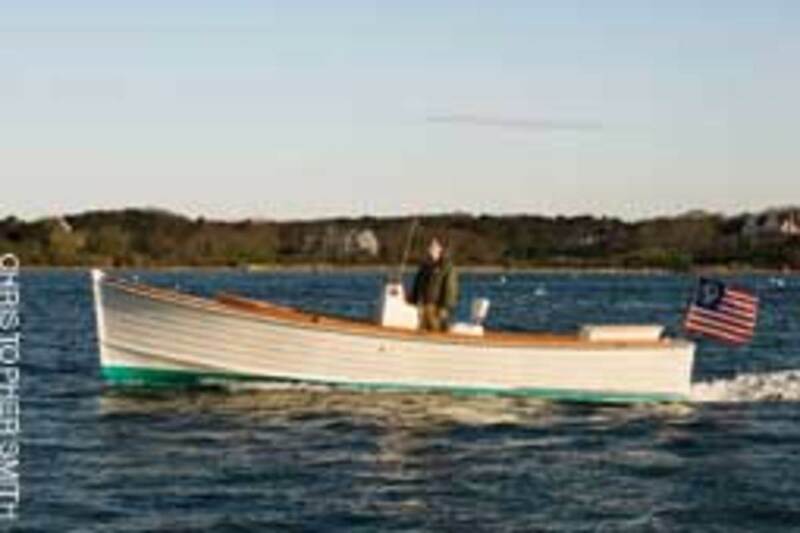 It&apos;s great to see the intelligence and experience in the Monomoy First Light and Cutwater boats. The First Lights are efficiently produced one-off custom wood-epoxy boats, with some economy of scale through the clever use of patterns. Any owner will be the beneficiary of a unique blend of simplicity and capability. The fiberglass Cutwaters have their own charms and will, from everything I&apos;ve seen, fill a void in the marketplace that should only get larger as people start spending money again. I hope to see more of the kind of thinking that went into designing and building these boats, increasing our options for the future. It can only be good for boaters and for the industry. Eric Sorensen is a consultant to boat- and shipbuilders and to the government. He was founding director of the J.D. Power and Associates marine practice and is the author of "Sorensen&apos;s Guide to Powerboats: How to Evaluate Design, Construction and Performance." A longtime licensed captain, he can be reached at eric@sorensensguide.com. This article originally appeared in the May 2011 issue.